Great Britain's Sophie Wells and Germany's Hannelore Brenner claimed the first individual gold medals in the Para Dressage Championship at the Alltech FEI World Equestrian Games™ in Kentucky, USA today. Wells, who is also highly-competitive in able-bodied sport and who competed on the fifth-placed British team at the European Young Riders Championship at Kronberg in Germany this summer, scooped the Grade 4 title. She produced a forward, flowing test with no mistakes from her chestnut gelding Pinocchio to score 71.677 which left her just over 1.5 points ahead of silver medallist Frank Hosmar from Germany while Denmark's Henrik Weber Sibbesen claimed bronze. "I was quite pleased with my test", the British rider said afterwards. 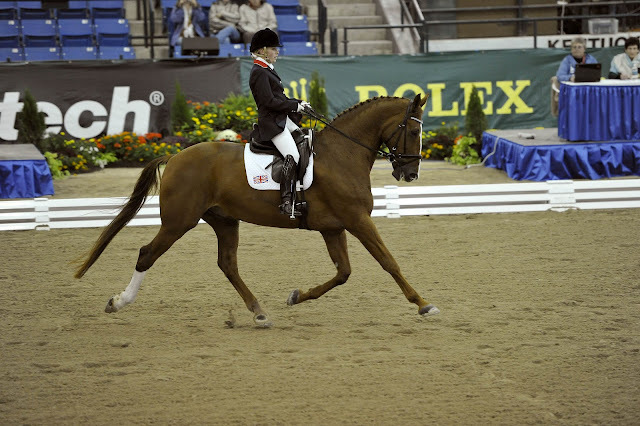 "My horse was a little difficult in warm-up, but I thought the trot-work was actually quite good. He came against me a little bit when I picked up the canter after the walk, but then he came back to me again which was good. When we were in here on Monday he was quite distracted by the open corners, but today he was much better. I think he was a bit nervous and was holding himself yesterday - it was a little bit up and down. But I'm still pleased overall with the test itself. It was good that we had a week before to get riding and get used to the weather and the surroundings", she added. The Para Dressage Championship is taking place in the Covered Arena, and silver medallist Hosmar's horse also took some time to get used to the venue. "Today my horse felt really good. Yesterday he was a a little bit tense because he was reacting to the sound of the sand hitting the plastic fence (which surrounds the dressage arena) and it was distracting him because the arena is so quiet. So today we asked if they could turn up the music so that we couldn't hear the noise", he explained. The German rider pointed out that today's test was more difficult, which suited his horse "because he gets bored easily and starts looking around. Today he was so relaxed, I could feel him waiting for me and so it was a really good feeling", Hosmar added. Hannelore Brenner has a lifetime of experience behind her and a long-term relationship with her 14 year old Hannoverian mare, Women of the World. The 47 year old rider's trophy cabinet is already full of awards won at European and World Championships and at Paralympic Games - she took team silver and two individual gold medals at the Beijing Olympic Games in 2008, and team and Freestyle silver in Athens in 2004. Today her score of 72.400 gave her Grade 3 gold while Denmark's Annika Lykke Dalskov (Preussen Wind) took silver and Australia's Sharon Jarvis (Applewood Odorado) took bronze. Women of the World gave Brenner a great ride. "We are like an old couple", the rider explained. "She knows what I think, and I hope I know what she thinks. She was so free and very happy." Brenner recognises the extraordinary progress in her sport in recent years. "Since 1999 the Para Sport has really taken a big step forward", she pointed out. That progress is more in evidence than ever before at these Championships and the British, who have long dominated the team medal podium, have both Germany and The Netherlands nipping at their heels as they go into tomorrow's competitions with a narrow lead. 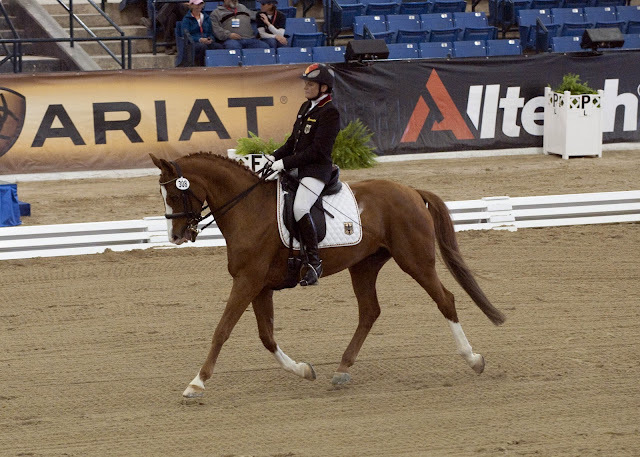 Riders will battle for the individual medals in Grade 1a, Grade 1b and Grade 2 and then the destination of the 2010 World Championship Para Dressage team title will be known.